Beautiful home for sale within Los Arcos, an upscale residential community in Cariari. This 300 M2 or 3,200 square feet home features 3 bedrooms, 2 1/2 bath, complete kitchen, dining room, laundry room, living room with chimney, TV Room, office, 2 car garage as well as carport, an Alarm system and several terraces. This home is surrounded by lush gardens. The location of this residential community is very convenient, at only 15 minutes from the center of the capital San Jose where you can find everything you need. The International Airport is located at only 10 minutes from the property. 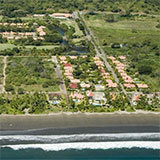 Please contact our Costa Rica real estate office for more information.